Today we had the privilege of serving at the Hands of Hope Clinic in San Rafael. We divided and conquered with several of us loving and playing with the kids, teaching them to make bracelets, treating hair for lice and styling these sweet little girls hair, and bed building for families. These beds become not only a place to rest ones' head but a couch and table as well! BUGS - We had an amazing and blessed day to be able to serve these beautiful people. 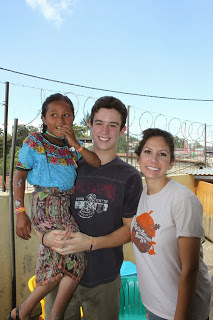 They will always have an imprint on my heart as I (Nicole) fell in love with several of the girls we were helping. These small children were the most patient little beings I have ever encountered while we spent over an hour just brushing through the nits in their hair. BANDS - Our kids bonded with the village children through Rainbow Loom Rubber Bands. Our kids also gave the village children temporary tattoos. This little girl was very proud of hers. Conner says that the village girls are very fast learners. After showing them how to make the Rubber Band bracelets, the girls were off and running making them on their own. BEDS - Our team built 4 beds today. First, we had to learn how to do it. The teenage boys (Ryan, Stephen and Jackson) jumped right in and pretty much ran the show. We delivered the beds to the homes. The bed recipients had to be approved, and do community service to qualify for the bed. Two women worked at the clinic while we were there, partially earning their beds by washing windows. We got to meet them and spend some time with them, which was very special. Two of the bed recipients are single mothers, which is unbelievably difficult in the Guatemalan culture. They were all so grateful and we were so blessed to be able to help in this way. This experience was life-changing. It makes you look at your own life and feel small and petty. The beds, which only cost $50 each, make a huge impact on the lives of these villagers. Think of all the ridiculous junk that we blow $50 on at home. While here, that same $50 can get an entire family up off of a dirt floor, onto a bed. It even helps prevent respiratory problems from sleeping on the ground. The villagers wear the most beautiful clothing. We saw young girls, as young as my (Amy) 6 year old daughter, carrying babies on their backs in a sling. Two of them are pictured here.